Neill Blomkamp is still a bit of a rookie in the film industry despite delivering 2009’s smash hit “District 9”. Now that it has been a few years and he’s parted ways with his big time collaborator Peter Jackson, Blomkamp is carving out his own path in Hollywood by making another piece of original sci-fi in the form of this summer’s bookend blockbuster, “Elysium”. Can “Elysium” deliver a compelling piece of summer science fiction or does Blomkamp get caught in the infamous sophomore slump? “Elysium” is set in a world during the year 2154 where the world has become overpopulated and the rich have built a utopian society on a giant space station floating above earth called Elysium while the poor are forced to work on the resource stricken grounds below. After suffering a horrible factory accident that leaves him with only five days to live, Max DeCosta (Matt Damon) becomes hell-bent on getting to Elysium where he can access the technology that can save his life. To buy himself a ticket from a smuggler named Spider (Wagner Moura), Max tries to kidnap a wealthy businessman named John Carlyle (William Fichtner) to download all of his crucial information from his brain. After the download is complete, Max realizes that he has played into something much bigger when a crazed mercenary (Sharlto Copley) begins tracking him down. “Elysium” is set up very much like a classic piece of character driven science fiction. The opening act of the film spends a lot of time establishing the world the story is taking place in and never feels convoluted or confusing. Despite having a setting filled with intrigue, the movie is far more focused on its characters and how this world is affecting the decisions they make to survive. The movie cleverly begins building momentum after the film’s introduction and the pacing from that point holds to near perfection where there is never a dull moment in sight. The movie is dedicated to staying self contained and focused on the story it’s telling by beginning and ending on notes that feel like a complete picture. It’s a rare treat to see a high science fiction story like this to be released during this time of year especially when nearly every other movie has been summer looking to create the next franchise. The movie carries a strong narrative and while the payoff in the end works on paper, I couldn’t help but shake the feeling that things may have wrapped up a little too nicely a bit too quickly. The storytelling in this movie is very organic, but the final moments of the movie don’t feel nearly as earned, as they should. These are more personal preferences and nitpicks than they are flaws, but the movie didn’t quite resolve in a way that was emotionally as satisfying for me as the rest of the movie I had just seen. Blomkamp snagged some much bigger names on his second outing with Matt Damon and Jodie Foster and for the most part, the bigger talent pays off. Damon delivers a great and likable lead with Max even though in retrospect the character is an incredibly selfish person who never hesitates to put his loved ones in harms way. Matt Damon continues to prove that he’s a high caliber actor who can bring shades of humanity to even the most unlikable characters. The protagonists of the movie are very well written, but Elysium fails to bring the same level of depth to the movie’s villains. Jodie Foster plays a corrupt, cold, and relentless Secretary of Defense on Elysium whose motives are less than inspired. The performance is passable, but the character never becomes anything more than two-dimensional. The character and performance that will undoubtedly be more polarizing than any other aspect of the movie is Shartlo Copley as the sociopathic black ops agent Kruger. Going into this movie I was really excited to see Copley play a more villainous role, and in many ways he doesn’t disappoint. Kruger is an elite killer who specializes in jobs that Elysium does not want to be directly connected to. It is made very clear in the beginning of the movie that he’s an especially brutal character who enjoys killing as much as I enjoy eating my favorite box of candy. His insanity carries a little bit of a snowball effect by the time the movie gets going and by the film’s end, he’s setting new standards for the term insane. Shartlo Copley plays this truly depraved and savage evil bombastically by never holding anything back. The energy that went into this performance mixed with the way the character was written leads to some interesting results. 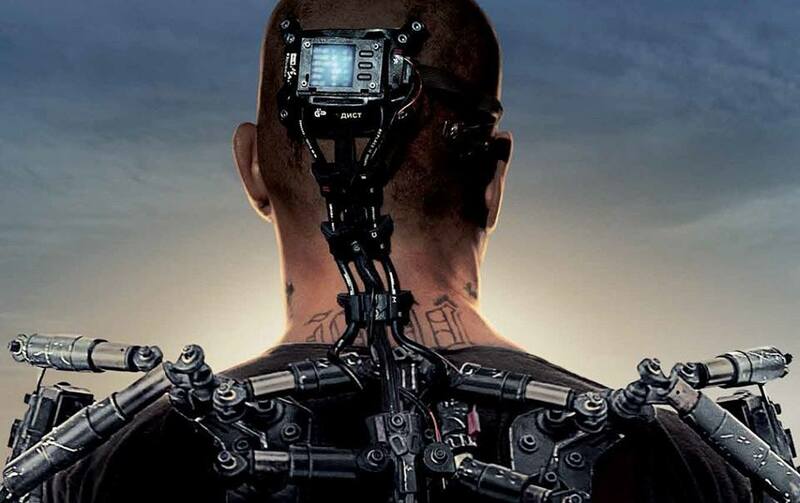 Copley played this character with so much grandiose energy that the character almost seemed cartoony and too over the top to fit into the grittier reality that “Elysium” successfully establishes. I can’t deny that I enjoyed Copley’s performance, but I couldn’t help but shake the feeling that he probably belonged in a movie that was taking itself a lot less seriously. Neill Blomkamp co-wrote, produced, and directed “Elysium” and despite only having done one movie before this, his style and stamp of creativity are written all over every aspect of this movie. “Elysium” only reinforces the creative vision he carries for his art direction, socio-political commentary, and character writing that was equally present in “District 9”. He is brilliant at creating worlds where the dark and dirty details are present, but never overstated or exaggerated. One could argue that the visual style and tone of Elysium is too similar to that of District 9, but it’s the subtle differences in story telling techniques that set the two apart. On a more practical level, Blomkamp’s only real Achilles heel in this movie is the camera work which is very mixed because of some severe overuse of shaky-cam in a couple of action sequences. There are very few directors in the history of Hollywood who have been able to tell science fiction stories on the scale that Blomkamp is working on. “Elysium” only cements his reputation of one of the best young directors in the business. “Elysium” is a great piece of high science fiction that delivers a film going experience rarely delivered by Hollywood on this scale anymore. The movie is smart, creative, and pays very close attention to the details of the reality it has crafted. Not all of the character work in this movie is great, but Matt Damon still holds his own and Shartlo Copley delivers a memorable (if a bit too over the top) performance. 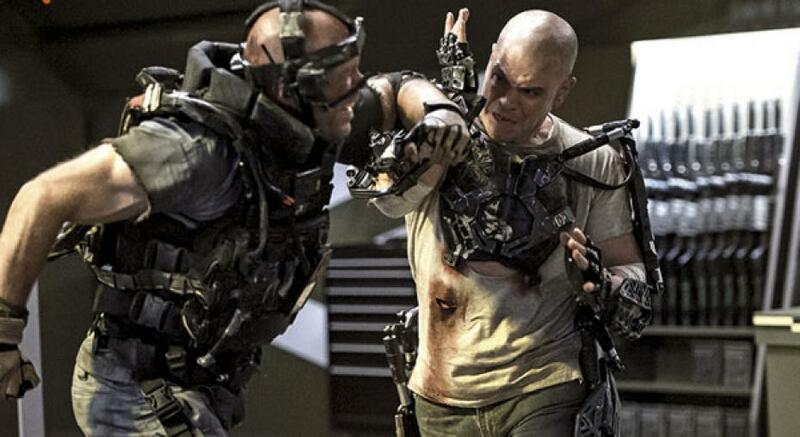 Despite a few shortcomings, “Elysium” is a must for genre fans and movie buffs. It’s got all the makings of a cult classic and easily warrants a full price for fans of science fiction. Elysium aims to tell an original sci-fi story in a the same way that sic-fi was written in the 1970s. The pacing is pitch perfect, the world is rich and full of detail, and the tale itself is fresh. I found the final moments of the film to be a little bit disappointing on an emotional level because things almost fit together just a little too well. Matt Damon is a strong lead who makes a relatively flat and unlikable character engaging and believable.The villains played by Jodie Foster and Shartlo Copley were a bit too two dimensional although both actors did enough to give the characters life. Copley played his character so strongly in fact that it may have been just a bit too much despite being incredibly enjoyable. Neill Blomkamp delivered a rare treat by giving us a world that felt rich and vibrant even in its most subtle details. His stamp of creativity that is filled with socio-political themes and an eye for a strong visual direction is all over ever aspect of the movie. His camera work was inconsistent with an odd mix of shaky-cam and close-ups during some of the action set pieces. Even with a few small missteps along the way, Elysium delivers on everything it promises. The movie is a hard sci-fi that is smart and tinged with some commentary about the haves vs the have nots and border control which gives some flavor and depth that should only add to its rewatchability. This is a rare treat, especially after a summer that has by this point has completely exhausted the big blockbuster spectacle category. BE a MAN and CHECK OUT ———-their ‘agenda’.